Tonight’s summer finale was about choice. Or about what a person does when they’re not presented with one. 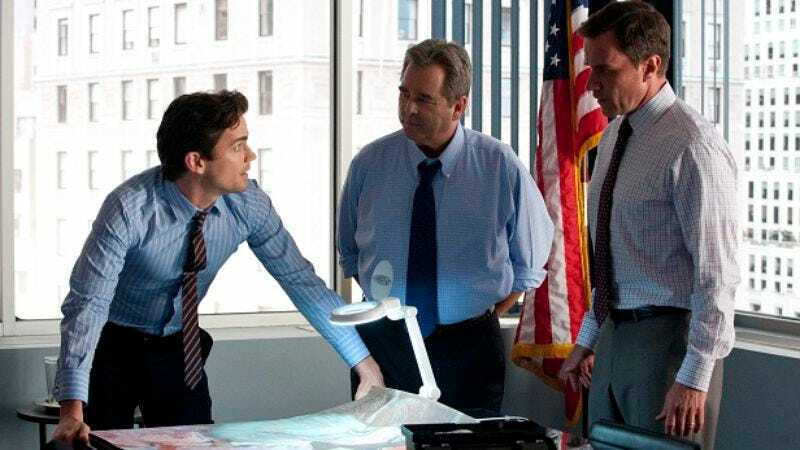 Distinguishing between exercising free will and acquiescing to ultimatum can be subjective, and only during the episode’s final seconds is one of White Collar’s protagonists put in a situation that calls for clear, singular reaction. Whatever lingering suspicion and guilt exists between Peter and Neal is going to be secondary for now, and remain that way for however long it takes to find Keller and rescue Elizabeth. When that does happen—which it most certainly will when season three resumes this winter—our two central heroes will have plenty to lay out on the table and resolve. Neal’s choices have undoubtedly put his friends in danger, and Peter’s relationship with Neal compromised his focus and instincts. You can’t help but wonder if Jeff Eastin and his staff were keeping tabs on what made Breaking Bad tick during its third season. Not to suggest Neal Caffrey is a worthy analog to Walter White (although more apt than Mozzie, whose transformation I cheekily likened to W.W.'s last week), but there is a similar pattern: Man straddles both sides of the law, man thinks he’s the smartest guy in the room, man incites chain of consequences that affect other peoples’ lives and, as is the case for Neal in “Countdown,” man is forced to confront the dire results of his actions. Of course, White Collar couldn’t be a more different show than Breaking Bad in every other respect, which is precisely what makes it so popular in its own right. Up until that final scene’s dramatic revelation, “Countdown” pulled out all the quirky, colorful, witty and charming stops of a hugely entertaining caper (and played out like a roll call of all the series' classic guideposts), all while summoning a suspenseful end game for Neal and Mozzie’s plans with the stolen U-boat art. This time, and for the first time with so much at stake, Neal was both a catalyst for the season’s ongoing storyline and the subject of a single episode’s investigation. Not that Peter had unimpeachable proof of the latter just yet. This leads to a stretch in which Neal and Mozzie pull off their most audacious con yet, and for Neal, his most decided betrayal of Peter’s trust. Guest star Beau Bridges comes to town in a guest turn as Peter’s FBI mentor, Agent Kramer, and alerts his division that a priceless Degas has been fenced and is in New York (i.e. Neal and Mozz’s authentic and recently sold “Entrance of the Masked Dancers”). Long story short, Peter sets to work undercover in an attempt to retrieve the painting from its new owner, while Neal and Mozzie work overtime re-creating a forgery and trying to plant it in said inheritor’s penthouse before the G-Men arrive, whisking away the real thing while they're at it. As always with a White Collar stakeout, it’s best not to sweat the details. Especially when the plot climaxes with Neal parachuting off a towering residential building and landing safely on a Manhattan side street, swooping up his trademark fedora and restoring it to trademarked side-cocked position without so much as an awkward stumble. The stunt was patently ridiculous, and a la Mozzie’s ATM trick a few weeks back, would have generated far more unwanted attention than actually transpired. (Last time I checked, for obvious reasons, NYPD and Homeland Security tend to be pretty vigilant about pursuing things like falling parachutists from the sky.) But I, for one, couldn’t help but laugh hysterically at and appreciate its hubris, and damn if it wasn’t pretty satisfying. Again, he might not be popping off on street dealers or witnessing acts of sadistic violence, but Neal’s got his own je ne sais quoi-ffrey. This was also memorably underscored during he and Mozzie’s initial Mission: Impossible-style break-in, which knowingly featured an old-fashioned Lalo Schifrin-ian soundtrack. As we know, things got precarious again in a hurry as soon as Keller re-entered, inexplicably shucking what appeared to be a peach, ominously warning Mozzie that comeuppance was on the horizon for putting a contract out on his head. At that moment, and especially after Peter checked in with Elizabeth at home, it should have been obvious that the one person whom all three of our male leads cared for in equal measure was Mrs. Burke, and that given Keller’s kidnapping past, she’d most certainly be snatched within minutes. Still, it was a surprise when the reality became apparent, and I admit to keeping my fingers crossed that when Peter arrived home, somehow his fears would be misguided. Keller has turned out to be a true menace after all, even if he does wear stupid hats and occasionally act out his best impression of someone doing their best noir-era impression. Which is exactly why he’s good for the show, as opposed to the kidnapping being random and unprovoked, and why it will be doubly satisfying when Peter catches him. As for the two men who’ve unwittingly created this mess, Neal and Mozzie, it’s hard to imagine either of them abandoning Peter’s side when it means Elizabeth’s life. And when she’s inevitably safe and sound, the odds are pretty good that Neal will finally realize that he’d rather be one of the good guys, even it takes years to regain Peter's friendship. That may not make for Emmy-winning TV, but it will still be fun to see how it gets there. • Is it just me, or does Beau Bridges always seem like he just walked out of pitching a cereal ad? • That said, pretty thankless role for Beau. Lot of overstated exposition. Bring back Rebhorn! • That hour-counter Mozzie had sure was in a glass of its own. Am I right? • A bit disappointed with Chlumsky having been such an easily charmed pushover. Hopefully her character will become more integral/interesting in the second half. • Speaking of shirts, did they only allow people to sketch in wife beaters at whatever con college Neal went to? • Love the scene with Mozzie and Richmond. Although why the stache? • This is similar to my complaint about proper phone-call etiquette after last week’s episode, but who says things like, “Meet me at my place tonight” without setting a specific time? I get that the ensuing caper is supposed to have a sort of timeless briskness, but that just makes me crazy. When would anyone ever just carelessly say, “Meet me at my place during the day”? • Was that whole fruit-slicing thing a reference to something? Or just a silly touch? • While discussing Keller, I did appreciate him mocking that Elizabeth suggested Peter come home and relax with his “favorite bottle of beer.” Who says that? • I love badass Diana. • “I’ll see you around Neal.” [Harsh-a] “You’re fooling yourself if you think this is who you really are.” Garson nailed the potentially hackneyed line, but it also leaves us with more to learn about Neal going forward. • I liked how they really sold Peter’s seething at the end by having him rediscover his aggressiveness throughout the episode. Gonna be an interesting second half. • Thanks for sticking with me this half-season, as always. Your comments and enthusiasm are as much fun as watching the show. So keep ‘em comin, and feel free to indulge me during the hiatus via Twitter @kennyherzog. Word.